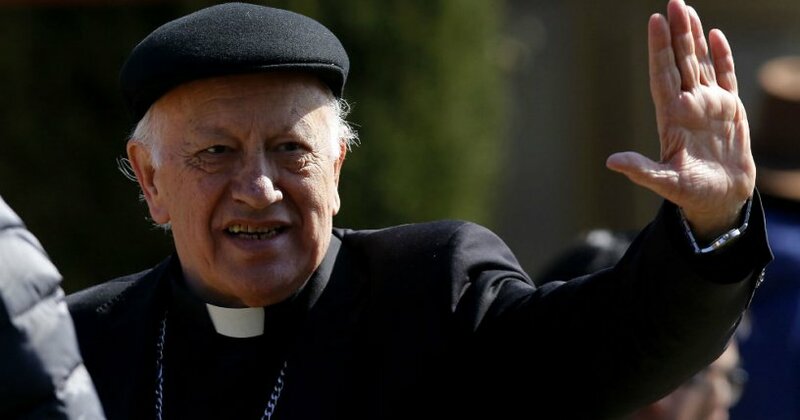 Cardinal Ricardo Ezzati is likely to be stripped of his Chilean nationality due to his alleged involvement in numerous sexual abuse scandals that have rocked the Catholic church. Ezzati, Italian by birth, was granted Chilean nationality in 2006. The House of Commons approved the measure “especially as a recompense for his work in the field of education,” reported La Tercera. However, as a score of allegations of sexual abuse against minors within the Catholic church came to light, Ezzati was accused of covering up sexual abuse complaints against members of the clergy, among other things. In May of this year, political party Frente Amplio bought up the issue in Congress and proposed the revocation of his Chilean Nationality. “Far from behaving like a priest, the Cardinal Ezzati has behaved, permanently, like a cruel person,” MP Gonzalo Winter explained to Radio Cooperativa. Following this, on Wednesday Aug. 8 a petition was presented and discussed in the Senate Commission of Human Rights. This was presented by Adriana Muñoz of the Party for Democracy (PPD) and Ximena Rincón of the Christian Democratic Party (PDC). “[Ezzati] does not deserve to retain this recognition and we think it is pertinent for the Congress to revise this concession and revoke it,” said Rincón. During Wednesday’s hearing, Rincón read a series of letters from 2015 that Ezzati sent to Cardinal Francisco Javier Errázuris in an attempt to divert accusations of sexual abuse against clergy member Fernando Karadima. It is believed that Karadima had been exercising his control over minors in the church to sexually abuse them since the 1980s. In response to the accusations against him, Ezzati is to be questioned by regional Federal Prosecutor Emiliano Arias on Aug. 21. Impunity has been a huge issue surrounding the Catholic church’s sexual abuse scandals worldwide. BBC states that Cardinals could have been receiving sexual abuse complaints as early as 1984, but that they were consistently covered up for decades. It is possible, therefore, that a final decision will not be made until Ezzati has given his statement to Arias on Aug. 21. The sexual abuse scandal has had a huge effect on the church and caused 34 bishops to offer their resignation to the Pope. Recently, Bishops in Chile called a special meeting in order to counteract the negative backlash surrounding the church due to abuse accusations. The Bishops promised to work with the Justice system and provide all evidence possible in order to bring the guilty people to justice and provide reparations for the abuse survivors.